After a weekend of dominant performances in the circle, the Ole Miss softball team is off to a good start. 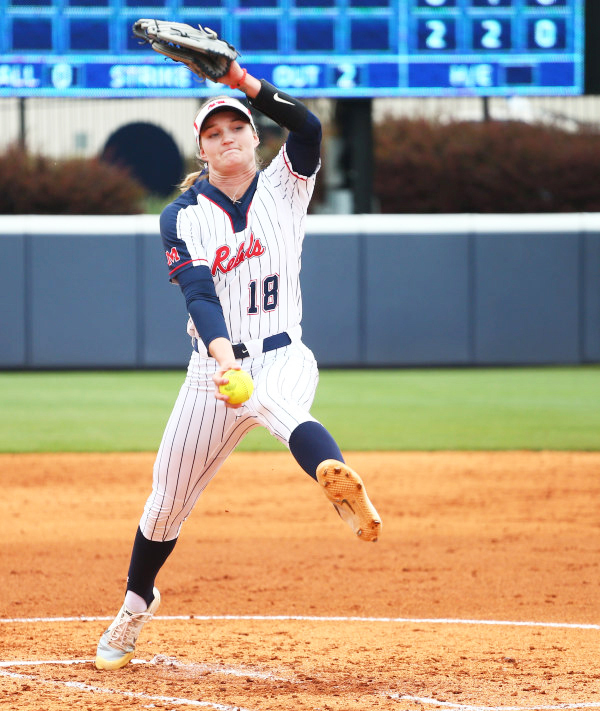 The Ole Miss softball team began the 2019 season with the Friends of Jaclyn Tournament inOrlando, Florida, this past weekend. The Rebels finished the tournament 3-1 despite the absence of their head coach. Mike Smith was suspended this past Wednesday for “not meeting the university’s expectations for operating the program,” according to a statement released by the university. Associate head coach Ruben Felix was tabbed to lead the team in Smith’s absence, which will end this week with Smith’s return. Nevertheless, the team didn’t miss a beat. The Rebels started the tournament Thursday, defeating the host team, the University of Central Florida, 3-0 behind a three-for-three hitting day from Kaylee Horton at the plate and a complete game shutout from Brittany Finney in the circle. Finney also got the scoring started for the Rebels with a single to left field that allowed Horton to score in the first inning. The Rebels faced the Ohio State Buckeyes the following day. Despite a fast Ole Miss start, a grand slam from Ohio State’s Emily Clark in the third inning gave the Buckeyes an edge. They defeated the Rebels 4-2 despite Ava Tillmann giving up just three hits. The Rebels had a chance late with a tying run on base, but they couldn’t finish the job. His team rebounded in a big way against the No. 21 ranked team in the country, Minnesota, with a 9 a.m. first-pitch time. In the fourth inning, the Rebels capitalized on an error and scored twice to take a two-run lead. That proved to be the difference, as Ole Miss pulled off the upset with a 3-1 win. Molly Jacobsen allowed four hits but shut things down late in the game. Just under an hour later, the Rebels had to turn around and take on George Mason. The Patriots proved to be no problem, as Ole Miss defeated them 8-0 in five innings due to the run rule. Abbey Latham got her team’s first home run of the season in the first inning, and the rest of her team didn’t look back. Taylor Watford sealed the game with a walk-off on her first collegiate hit. The Rebels were unable to get revenge for Friday’s defeat against Ohio State due to rainy weather on Sunday. Ole Miss will be back in action this Thursday when they travel to take on Loyola Marymount in Los Angeles.